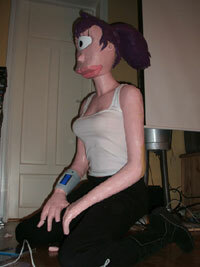 Yep, you're seeing it right: someone decided making a computer case that looks like Leela from "Futurama" would be a good idea. And nobody murdered him before he finished it. I don't care what CTS' last article says, that's pretty much proof positive there is no god. You can look at the site for more pictures, plus a big stat bio on Leela, but really I wouldn't recommend it unless you'd like to take a long, hot shower afterwards. If you're the guy who made the case, on the other hand, you need to take more showers, preferably with your creation sitting on your lap.